While both options are safe and effective, Botox and Juvéderm operate on totally different principles — and produce even better results when used together. Here’s what you need to know about these two popular injectable treatments. Collagen is a protein in your connective tissue. Think of it as the “glue” that holds your body together. Over the years two things happen: 1) the collagen breaks down, and 2) your body doesn’t produce as much as it once did. Additionally, your facial muscles form certain patterns based on your habits. For example, if you wrinkle your forehead a lot when you concentrate, you’ll develop wrinkles across your forehead quicker. Lip lines, the furrow lines between your eyebrows, and the creases in the corners of your eyes are other examples of what are known as dynamic wrinkles. Enter Botox and dermal fillers! Botox has been around since 1989. It’s an injectable toxin that “freezes” your muscles, hence the perpetual “frozen faces” some celebrities have. Originally Botox was first used for something called “spastic eyelids,” but doctors quickly noticed its skin smoothing properties and began using it off-label (i.e. for wrinkle reduction). The FDA approved it in 2002 for smoothing frown lines between your brows. Since then, it’s become the most popular cosmetic medical option available for wrinkles, just about anywhere in the world. Botox is a simple in-office procedure that can be done over your lunch break with a few strategically-located injections. It’s especially effective for reducing fine lines around your eyes, smoothing out lines around your mouth, and on your forehead. In fact, the American Society for Aesthetic Plastic Surgery says Botox recipients feel they look an average of 5.6 years younger. Botox “trains” your muscles overtime. This means they’ll stay relaxed with less frequent injections. Some patients will find one or two injections can give them the appearance they want for a year or more. Don’t get too many units injected. Over-injecting isn’t dangerous, but it can lead to a frozen, droopy, or startled look. Note that there’s little that can be done to “reverse” the effects of Botox in such cases. The best you can do is wait for it to gradually wear off. Be patient — the product’s full effects won’t show until a week or two after you’ve been injected. If you’re getting Botox for the first time, make sure you schedule follow-up appointments with your injector to determine when your next series of injections should be. Make sure that your injector uses well-known, “brand name” botulinum injection products such as Botox, Xeomin, or Dysport. The appropriate dosage on generic products may be harder to determine. Juvéderm is an injectable filler that adds hyaluronic acid to your skin, plumping it up. You’ll see an improvement right after your injection, but you’ll need to wait up to two weeks for the swelling and bruising to resolve. The results from one injection can last anywhere from six months to a year or more. Don’t get too many syringes injected. A little filler can add a delightful touch of pout if you have naturally thin lips, but if you go overboard you can get the dreaded duck lips. In the cheeks or temples, it could lead to overly-puffy contours or unappealing bulges. Don’t get too many injections done at once. Each injection has to deliver tiny amounts of product to a precise area of your cheek. If too much filler is used or if it’s injected too low, you’ll be left with chipmunk cheeks. To maintain a natural and more youthful appearance, it’s a good idea to get one treatment at a time and wait a week or two to see how it affects your appearance. Don’t massage the treated area after your injection. Only your injector should do that — improper massage can cause the filler to migrate. If you notice lumps under the skin, your injector may suggest hyaluronidase injections to dissolve them. Botox and Juvéderm make good partners. They smooth away wrinkles and provide a nice lift in your whole face, filling in areas that are sagging or hollow. You can even schedule both injectable treatments be performed at the same time. Dr. Machida also advises that if you are using Botox and Juvederm together, “At some point it might mean that you need a more definitive treatment, such as fractional laser, Renuvion, or a facelift.” In any case, it’s best to go for a personal consultation with a qualified specialist. Should separate appointments be scheduled? Separate appointments are not needed when getting Botox and a filler such as Juvederm because they work quite differently. While Botox is specifically designed to reduce fine lines and wrinkles, facial fillers such as the Juvederm line of products help sculpt the face, soften folds and lines, and provide accent where desired. A skilled injector will use the products best suited for your particular needs, oftentimes combining them to achieve a balance that accentuates your best features while minimizing those you are not as fond of. Our fees reflect the standard which is charged in our area. In different parts of the country, prices can vary dramatically. Fees for Botox are typically in the $12 to $15 per unit range. Most women require a minimum of 20 units to treat an area such as the frown lines between the eyebrows, or crows feet at the corners of the eyes, and 40 units or more if treating multiple areas. It is not unusual for men to require more units than women. The reason for this is that the treatment areas on a man’s face are generally larger, and the muscles we’re trying to control tend to be more aggressive. 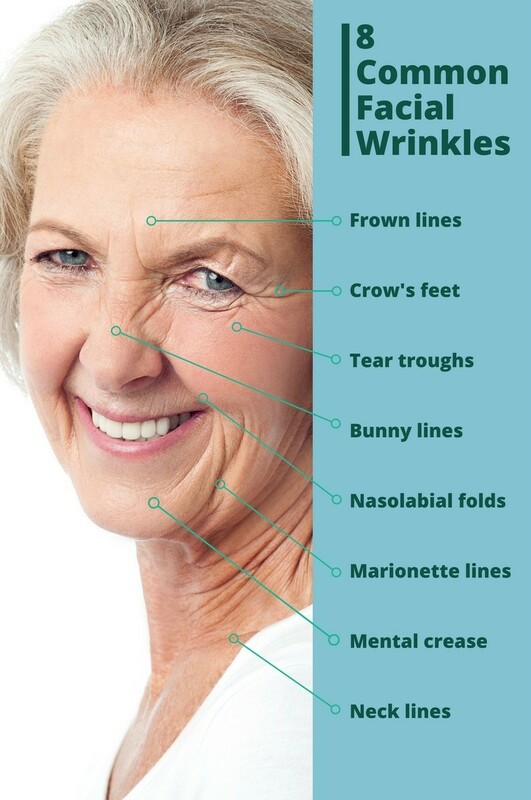 Botox can be also used for more than just wrinkles — a skilled injector will suggest how it can best be used for you. The Juvederm line of facial fillers include Juvederm Ultra, Juvederm Ultra Plus, Voluma, Volbella and Vollure. Each of these fillers differ in their composition and are formulated to address specific areas of the face. They are great for building cheekbones, filling lips, eliminating fine lines, reducing jowls, masking scars, providing lift, and so much more. Fillers can also be used to rejuvenate the hands, which often show tell-tale signs of aging. They can provide a lift of the nose tip, help to soften a crooked nose, or correct asymmetry of the face. The cost of facial fillers is usually determined by the number of syringes used. Fees usually range from $475 to $875 per syringe. You can save money by combining products. By joining Brilliant Distinctions, the reward program affiliated with Botox and the Juvederm line of fillers, you can also earn points at every purchase and save money off your next visit. You do not have to redeem a coupon or wait for payment. How soon will I see results, and how long do they last? The longevity of the products vary. Botox is usually recommended every 90 days. Most who get it find it well worth the expense. It is one of the most popular products available, and for good reason: it produces great results at a reasonable cost. Juvederm products can last from nine months for some, to two years or more for others, making them very cost-effective over time. Botox can take several days to two weeks for you to see the best results. The effect wears off gradually. Facial fillers are more instantaneous, but there is potential for mild swelling and occasionally a bit of bruising, so it too can take up to two weeks for the final result to show. For products which stimulate the production of collagen, improvements may continue well beyond the first few weeks. The field of injecting is constantly changing, with new products and new techniques evolving at an incredible pace. As such, it is important to seek qualified professionals with the experience and skills necessary to deliver the best results. We frequently send our injectors to train with some of the country’s top doctors, attend workshops and conferences, and receive individual training with specialized trainers. All in all, exploring the use of Botox and Juvederm facial fillers is seen as an excellent investment. Patients between 25 and 75 years old may be good candidates! In skilled hands, these products can take a decade or more off an aging face, and serve as a preventive measure or enhancer for those who don’t yet show significant signs of aging. Eleanor Welsh is a contributing health and beauty writer for Zwivel. She is the Founder and President of Skin Vitality Medical Clinic. With 8 locations in southwestern Ontario, Skin Vitality is the leading provider of Botox and Juvéderm in Canada.